Hi alll........my name is Amy. Next week is my sister's birthday and she loves cats. 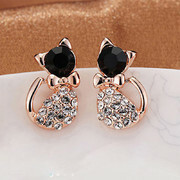 I was thinking of buying her a present related to cats.....(not a cat haha), so I thought about these earrings. What do you think? which one do you like? please help me! any idea? I like the top ones. Those are cute. 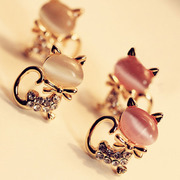 The bottom darker kitties are cute. Taking a closer look, they look neat.